As 2017 comes to an end and we get ready to begin a new year, here is a quick recap of all that happened with the death penalty this last year. A Historic Low Level of Public Support: Public support for the death penalty has fallen to a 45 year low according to an October 2017 Gallup Poll. In a nationwide survey of 1,028 adults polled October 5-11, 2017, 55% of Americans said they are "in favor of the death penalty for a person convicted of murder," (while 41% of Americans oppose the death penalty) down from a reported 60% in October 2016. An Overarching Level of Decline: In 2017, executions (23) and death sentences (39) were both the second lowest in a quarter century. Even though executions in the US in 2017 will surpass the 20 of 2016 (there were a total of 23 in 2017), the analysis shows that the average number of executions in the United States over the past 3, 5, and 10 years will drop by 8.4%, 9.1%, and 3.6%, respectively. The death penalty is coming to an end! Problems with Executions: 2017 has witnessed several difficult issues with carrying out an execution. Alva Campbell Jr. in Ohio.l suffers from a severe health condition that makes finding a suitable vein for injection extremely difficult. In November 2017, after over two hours of medical personnel trying to find a suitable vein, Campbell's execution was called off. Additionally, issues with the source of lethal injection drugs, as well as questions surrounding severe mental illness, intellectual disabilities, and legal counsel in several executions brought to light that the death penalty is a broken system which is cruel and unnecessary. Exonerations: In 2017 here were 4 exonerations throughout the course of the year, making the total number 160 people who have been exonerated from death row since 1973. Stays of Execution: CMN supporters made a big impact this last year. Through CMN’s Mercy in Action, over 13,000 letters, countless tweets, phone calls, and prayers were completed in the name of life. Overall, CMN helped to contribute to the stays of execution for over 20 individuals in 2017. Want to take action to stop the scheduled executions in 2018? Join CMN's Mercy in Action Project and receive updates and tools to advocate for life! As this year comes to an end, we celebrate the turning tide of national opinion against the support for the death penalty. We give thanks for the lives spared due to exonerations and stays of executions. We also recognize that the death penalty is still a reality for much of the country. There is lots of work to be done, but the advocacy efforts from CMN supporters give us hope that the momentum in this movement to end the death penalty is just gaining steam! This next year we will continue the fight to end the death penalty and promote the use of restorative justice. We hope you join us! 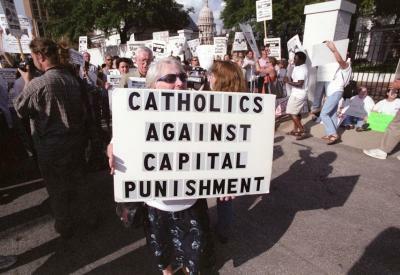 Iowa Catholics: Don't let IA reinstate the death penalty!